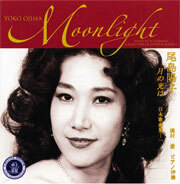 A Collection of Japanese Songs - I "Moonlight"
In this Japanese Song Album, "Moonlight", I dedicate to my mother who introduced me to beautiful music and pleasure of singing. In this album, I selected the songs of my mother's favorites as well as mine. It is my pleasure if you find your favorite songs and keep them in your heart from this album. Ai Kajimura was graduated from the Musashino Academia Musicae. She studied piano with Ms. Michiko Kamiyama, Ms. Yoshiko Okami, Ms. Haruyo Iwatani and Mr. Norman Beedie. She was a piano accompanist to the Nippon Club Women's Chorus since December, 1997-June, 2000. "Opera al Fresco in New York"